Schooooool's out for summer! I got out a week ago and spent the first week of summer lounging at the beach. THE beach. That would be Myrtle Beach to all you non South Carolinians out there. It is a crazy Atlantic coast tourist beach for those of you that aren't familiar with it. It's like the Vegas of beaches, only replace casinos with miniature golf courses and club wear with air brushed tee shirts. It's a lot of fun. Great place to lounge on the beach, hang out with family and people watch. J's mom was kind enough to treat us to an awesome vacation (thank you!). Baby Jane thoroughly enjoyed her first time playing in the surf. Before we left, I bought some beach-y looking rayon at Joann's to make up the pants version of Simplicity 1887. Only when I got home to cut the pattern out, I chickened out. I was worried that all that print would make the pants too crazy to wear. So I opted to make the shorts instead. I am so glad I did because they are awesome. I wore them nearly every day of our trip. I read a few reviews of the pattern before I started and all of them noted the enormous amount of ease in the pattern. I went a size down and the fit is great. They are still loose but I tend to like a little more ease anyway. I made them up just as the pattern directed. No changes other than using a one inch elastic waistband instead of making the two channels and putting in two skinnier pieces of elastic. Is there a reason two pieces of elastic are preferred over one thicker piece? Just curious. I also shortened the hem two inches. The seat is just a tad bit snug but using a drape-y rayon makes it not very noticeable. If I made these again in a more stable fabric I would do an aptly named full seat adjustment. I cut the shorts with the stripe running vertical. I tried not to over think pattern placement too much. Just tried to make it symmetrical. I don't think there is anything too unfortunate going on. Maybe. After I made the shorts and they were such a success, I decided to try the skirt since I had so much fabric left. Again, I made the skirt up as directed except for shortening it a couple of inches (I made the longer version and probably hemmed it up to the mini version. The skirt has a cute tulip shape. Not really noticeable in my drape-y rayon. I cut the skirt so the stripe ran horizontal. 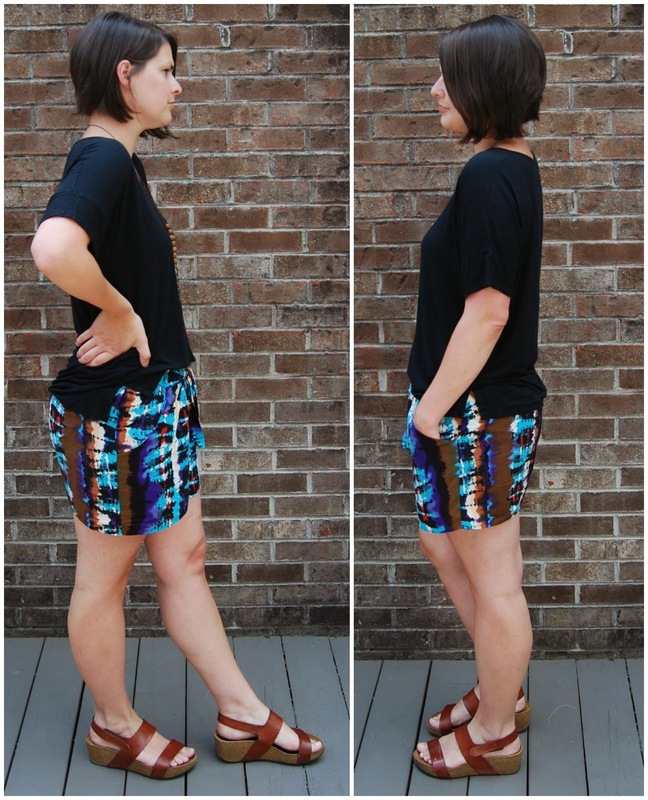 The shorts are unlined but the skirt is lined in a navy rayon challis. I treated the lining more like an underlining, basting it to the front and back pieces before sewing the side seams. My hem is a little wonky because of that but not enough to bug me. I'm wearing the skirt with my grey circle tee and I am really liking the laid back combination. My circle tees are in heavy, heavy rotation by the way. I think I'm going to have to make another in the same cotton jersey as the grey one. It sees the most wear of the three. Not really anything else to say except I really enjoyed making this pattern up. It was straight forward to put together and the finished product is easy to wear. 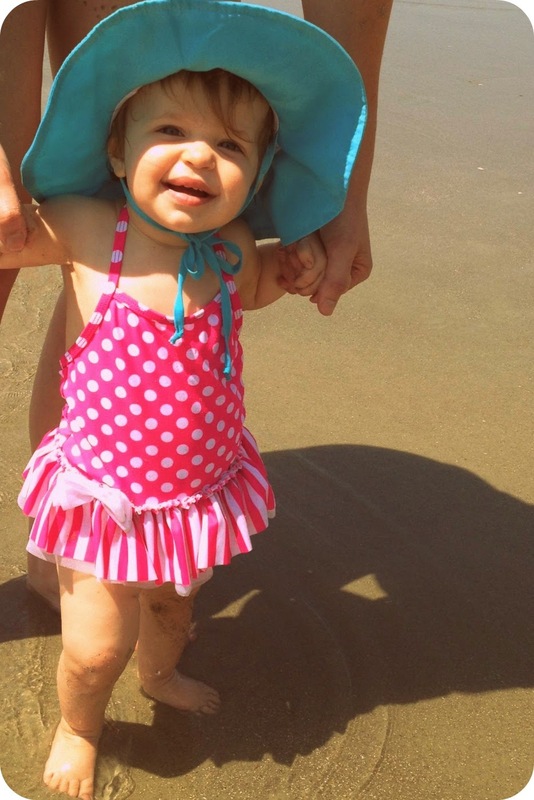 Baby Jane loved the beach. She played in the surf for hours, picking up seashells and putting them in her bucket. She had no fear of the ocean. I'm not entirely sure that is a good thing since I couldn't take my eyes off of her for a second or she would have crawled in to the waves. She is walking like a champ if you hold her hands but the moment you let go, she falters and sits. I know she'll take off any day now so I'm trying to enjoy these last few moments of crawling baby. She is such a joy! The more I stare at this the worse it gets. I almost didn't post about this. It's pretty bad. But I am hoping maybe someone has a good suggestion for fixing this kimono. Or whether it's even worth fixing. 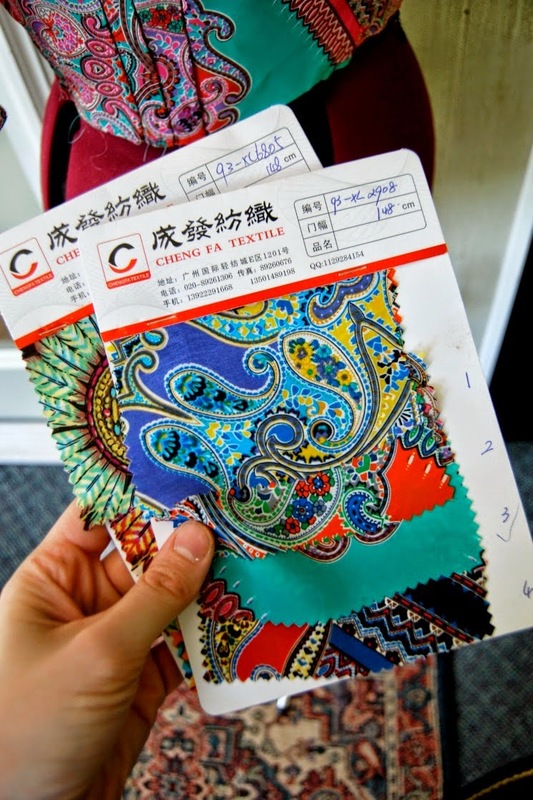 I used the other crazy print fabric from J's trip to China. You can see my failed Nicola bodice still on my dress form. I'm not removing it until I come with a brilliant idea to save it, by the way. I had no idea what to do with this particular fabric. I mean, it's pretty wild. Feather flowers/dream catchers/psychedelic floral? I don't know. There's not a whole lot you can do with a fabric like this. It's like a bad Hawaiian shirt. I originally took some photos of me wearing it with shorts, but they are so bad I won't be showing them. It looks marginally better with skinny jeans but definitely still has the same touristy shirt vibe. 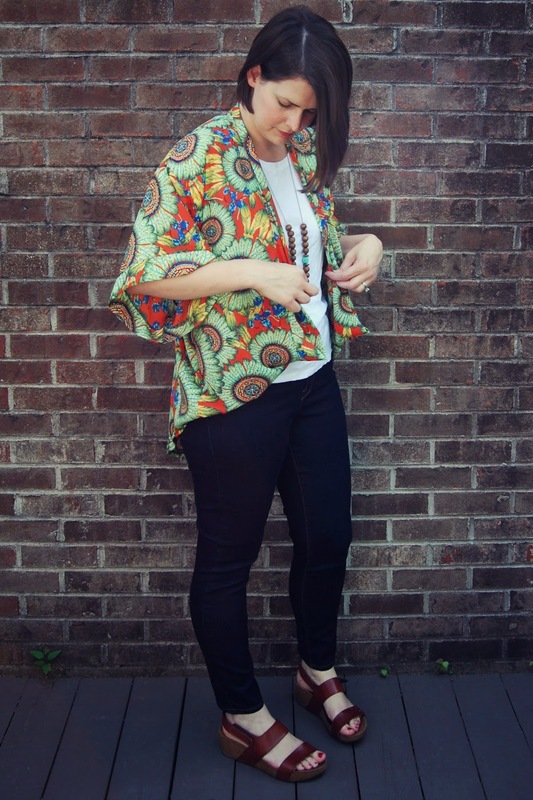 The tutorial I used tells you how to measure a bunch of rectangles to make a kimono. I made it up as the tutorial specified but was not happy with the finish. So I tried to beef it up afterwards. It looked like a bad robe. I put a big inverted pleat at the back neckline because the shoulders hung so low it looked ridiculous. Then I finished the neckline and sleeve cuffs with wide bands instead of just turning under and hemming. Maybe taking out some of the width in the back contributed to the Hawaiian shirt look. Using a wild printed fabric didn't help. 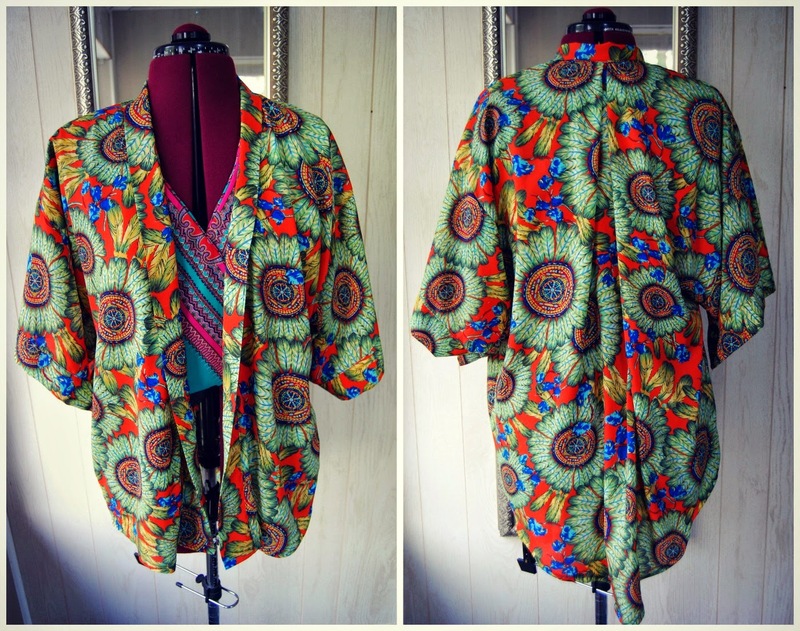 I think a kimono like this should be made up in a more delicate fabric. Sheer. I also think the length is all wrong. Either it needs to be shorter or longer. In fact, I'm thinking about cropping the front up super short like so. Let's be honest, I'll never wear it as is. I'm kicking myself for not using this fabric to make another quarter circle maxi skirt. What do you think? Is it worth trying to save? Am I just wearing it all wrong? What on earth do you wear something like this with anyway? Or should I just admit defeat? 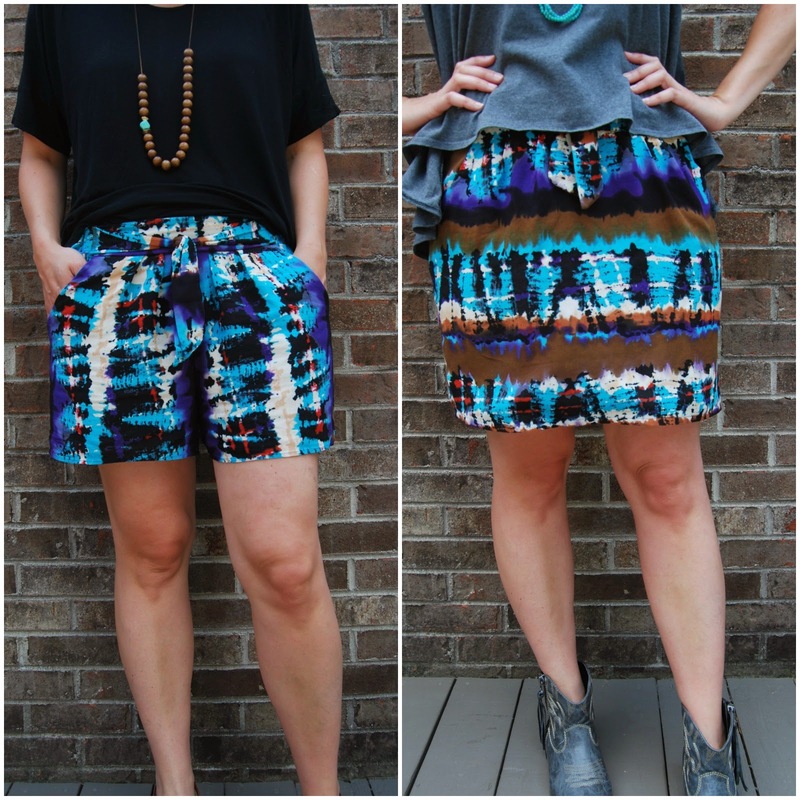 Back in the day, pre-blog, I made a simple skirt from some Tina Givens quilting cotton. It was one of my favorites for a long time. I actually wore it out, though that was probably from shoddy sewing more than anything else. I have another cotton print of hers that has survived a couple of stash purges now even though I don't sew with quilting cotton anymore. I've always liked her fabric prints. They have a cool, global feel. But really, I like that you can tell Givens' original designs were most definitely done by hand. That they began as an actual physical brush-and-paper artwork. I came across Tina Givens' sewing patterns one day while browsing the interwebs. I am fully aware that they are not every one's cup of tea. I can admit that they might look like something an aging art teacher would wear. But I say that with love. There is something about about her patterns that I really like. I like linen, especially rumply linen. I told you in my last post that I am drawn to volume here lately. And I just so happen to be an art teacher- ha! Maybe that's it. 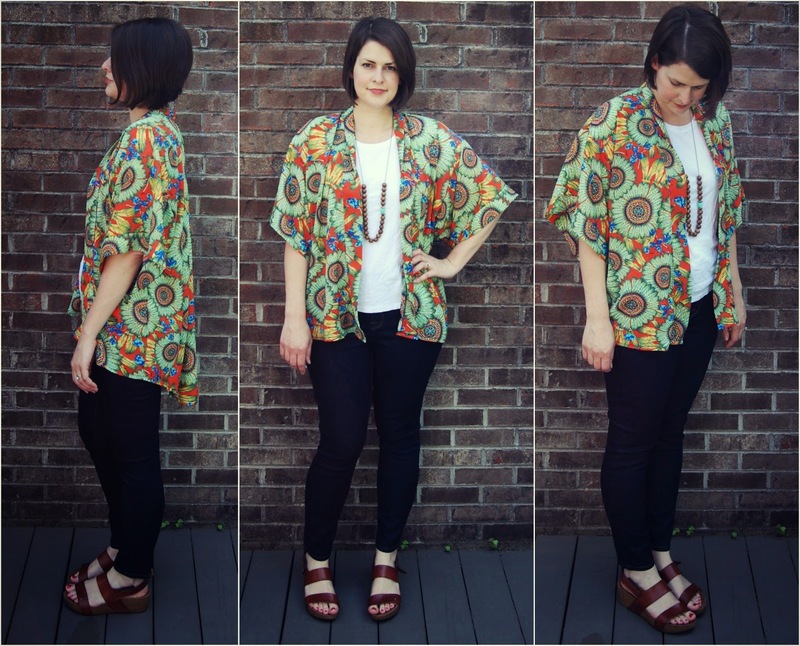 I made the Luella tunic twice. Both from some fantastic, rumply, medium weight linen which was so much fun to sew with. The first version was the midnight blue one which I made up exactly as it was designed except for a change to the neckline. The white version I made next with a few more changes. I shortened the back skirt, as you can see. I also shortened the sleeves some, reduced the width of the bindings and widened and lowered the neckline. I found the v-neck to sit high on me when I sewed it up as drafted. When I realized the neckline was too high on the blue version, I just lopped off the binding and scooped out the neckline pretty haphazardly. I probably should have left it alone because I ended up with a great big sloppy-looking neckline. My solution to fix it was to put in an inverted pleated at the front before finishing it with bias. After looking at these photos, I think I'm going to back and tweak the blue version. I'd like to try and bind the neckline like the white version even though it will be deeper. And I'd like to shorten the sleeves. I do, however, love the crazy sweeping ruffly hem. And I'm not normally a ruffly sort of person. Don't be fooled by the ease. Yes, this is an over-sized pattern but it is not a bunch of rectangles. The seams are curved and unusual. And those funky little pleats in the side seams are really something special. I think, anyway. I made a size small, which the pattern says fits a 2-8. I normally wear a 10 for reference. I finished my ruffles with a rolled hem on my serger. They kind of remind me of napkins. The instructions tell you to serge the edges or zig zag and let them fray. I almost wish I had done the frayed edges. Seems fitting on a top like this. There is quite a bit of ruffling to do! I found the best way to do the gathering was to zig zag over a piece of upholstery thread. I love how the ruffles are sewn on the outside of the top. I do have a couple of negative observations to make. I ordered a printed pattern because I hate, like hate with a passion, taping together pdf patterns. So imagine my disappointment when I got my printed pattern and still had to tape some of the pattern pieces together. I got over it, though, when I realized that it was only a minimal amount of taping. I think there were two pattern pieces that had to be pieced. It was really not a big deal. Also, the instructions are pretty vague. You have to know your way around a sewing pattern to sew this up. 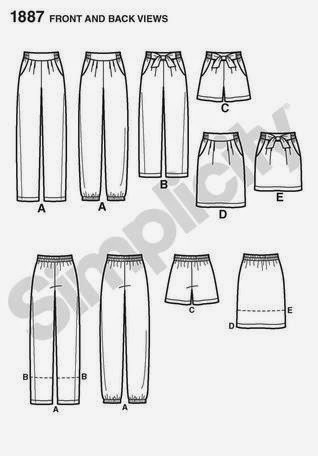 There are a couple of technical drawings included in the pattern instructions, but no finished pattern line drawing. I use pattern line drawings more than anything when I'm trying to figure out how to sew something. I am thrilled with both finished tops. Especially the white one. I know I will wear it with shorts for the summer like above but it will transition perfectly in to fall with jeans and boots. It's different and swingy and fun to wear It's a weird and wonderful pattern! I bought another Tina Givens pattern that I plan to make up this fall, but her Zoe dress pattern is calling my name for this summer.